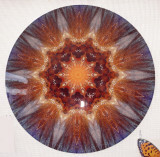 My mandalas can be ordered right from this website. Just add the images you want to your cart with the add to cart button below each mandala and pay securely through paypal. Make sure you select the right size in the drop down menu. Alternatively, you can send a check to me, just email me for the address (ecoridges@gmail.com). They will be shipped normally within 2-4 weeks. Mandalas are available as aluminum or canvas prints. Aluminum prints are circles. The aluminum brings out the detail and luminosity of the mandalas like no other substrate. The ink is infused into the aluminum. They are very durable and have a gloss finish. They give the appearance of translucency. 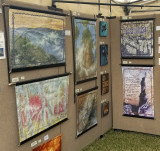 Customers frequently ask if there is light behind them when they are hanging in my booth, though they are completely opaque. They look as if they are printed on glass. The aluminum prints have 1/2" float mounts attached for hanging on your wall. If you would like to have one to be used under glass on a table, it can come without a float mount if requested when ordered. Aluminum prints can take 2-3 weeks to produce. 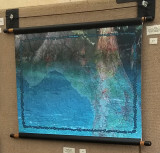 Canvas prints are squares and can be ordered as a gallery wrap or a scroll (20"+) (Map examples pictured below). They give a textural look and feel. The mandala image will be inset some from the edge and have black around the mandala. Gallery wraps have black borders along the sides and are ready to hang. For prints 8x8 and 12x12, the gallery wraps are 3/4" deep, while larger gallery wraps are 1.5" deep. The scrolls are loose canvas with rod pockets at the top and bottom where a curtain rod or dowel can be used to hang them with a curtain rod bracket or cord (not included). A bottom rod is only used to keep the mandala hanging straight. Due to the rod pockets, the scrolls are 2" longer than the image size. The scrolls give a old-time feel to the mandalas as tapestries were hung in this manner for centuries. All mandalas come with a paper print of the original 4x6 photographs. They are limited edition prints of 250 and signed. I met you briefly last evening as you were about to break down your booth at the art show in Hobe Cove. I was so impressed by your work that I posted some photos of the mandalas on my FB page. A number of folks are interested! I thought I'd received an e-mail or read on your site that you are offering a 20% discount on orders this month, but I cannot find a copy or see a discount offered on the site. Am I imagining that? It would really help me out, but if you've ended your offer I understand. I love your work.